In order to keep up with today’s changes in business needs and infrastructure capabilities, companies need to take on a modern cloud-native approach to application architecture, development and delivery. Cloud-native platforms can enable your organization to deploy new code fast, reliably run applications at cloud scale, and improve security; but adoption is often hindered because of challenges like integrating cloud native software platforms with legacy infrastructure, limited availability of tooling, and more. 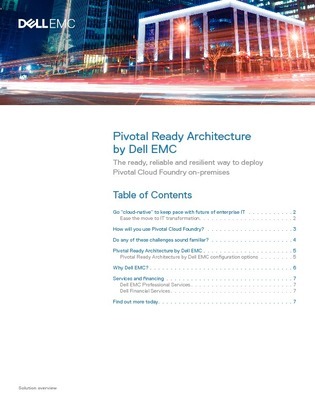 Download this white paper to discover how Pivotal Ready Architecture built on a hyper-converged infrastructure reduces complexity of adopting the cloud, from installation to ongoing maintenance.